Updated 3/9/12: One of our avid cooks here on the Food Channel recently sent us pictures and notes on her experience with this recipe. Chitra Dasi made a half-batch of these, and only baked them for about 20 minutes because of her oven. You can see the results in the picture above. (Thank you so much Chitra!) Have you tried this recipe yet? 2) Sift together buckwheat flour, baking soda, and cinnamon; then set aside. 3) Blend together butter, sucanat (or brown sugar), apple sauce (or banana), and yogurt until smooth. Pour in dry mix and combine ingredients. Muffin batter should remain slightly lumpy and imperfectly mixed. 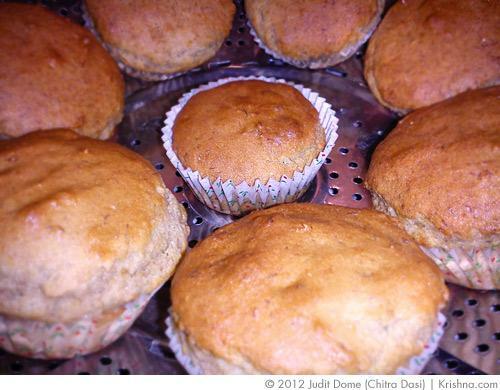 4) Spoon batter into muffin tins and bake for about 25 minutes or until cooked at the center. Insert a wooden toothpick and it will come out mostly clean when the muffin is done baking. You might also try adding dried fruit or nuts to the batter after you combine the wet and dry ingredients. Buckwheat flour is a popular substitute for wheat flour on Ekadasi days since it is not a grain and thus approved for days when you are fasting from grains. Please try this recipe and let us know how it works, or doesn't work for you. If we can turn this recipe into a success, it will be added to our catalog of recipes here on food.krishna.com. Submitted by Anonymous on Wed, 03/06/2013 - 20:59. Submitted by Anonymous on Mon, 11/12/2012 - 13:01. I used 1 cup banana & 1 cup applesauce and followed the recipe as stated. Then I folded in just over a cup of dried apricots that were soaked in water for 1/2 hour and cut into small pieces and also just over a cup of chopped walnuts. This recipe was happily received. Submitted by Anonymous on Fri, 09/21/2012 - 13:28. * કુટ્ટિ / કુટ્ટિ નો દારો in Gujarati. Submitted by Anonymous on Mon, 09/10/2012 - 16:35. Submitted by Anonymous on Sat, 09/08/2012 - 23:23. Just made these exactly according to the recipe, and my first taste was good. The cinnamon and banana (plus some chopped cooked apple yield a nice flavor. Hopefully they are still good for breakfast in the morning. Submitted by Anonymous on Fri, 07/13/2012 - 23:37. What amount of oil did u add? Submitted by Anonymous on Thu, 07/05/2012 - 12:45. Submitted by radha on Thu, 07/26/2012 - 15:32. Hare Krishna! Buckwheat is actually not a grain. It is a seed, and is commonly used in substitution on Ekadasi days because buckwheat flour acts similar to wheat flour. Baking soda is used on Ekadasi days because it is sodium bicarbonate (a mineral). But if you buy an inexpensive kind, do look at the ingredients because some companies cut it with other ingredients at times. Submitted by Anonymous on Mon, 04/16/2012 - 12:39. I tried this out with oil instead of butter and it came out well.. Submitted by Anonymous on Mon, 04/16/2012 - 12:37.